In non-breeding plumage, the male only shows very restricted blue wattle around the eye. It has olive green head and back with some iridescent blue feathers on rump and uppertail-coverts. The tertials are blackish brown with greenish-yellow edges. On the underparts, the area from throat to lower breast shows more prominent dark mottling or barring. The adult female resembles non-breeding male, but she lacks wattles and blue feathering on rump. The underparts are duller yellow, slightly brighter on flanks and washed olive on breast. The juvenile resembles female with pale fringes to wing-coverts. The bill base is pale pink. 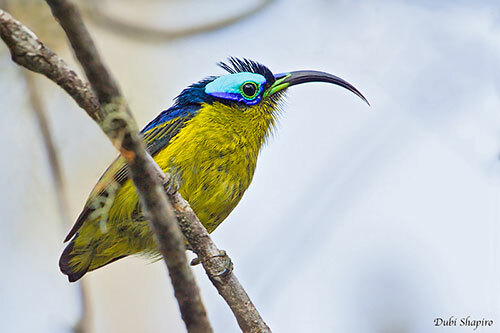 The Common Sunbird-Asity is found in E Madagascar along the entire length of the eastern forests, from Tsaratanana Massif and E slopes of Manongarivo in N, S to Andohahela and Tsitongambarika. The Common Sunbird-Asity frequents mid-altitude and lower evergreen humid forest from 500 to 1,500 metres of elevation, but it is most common around 1,000 metres. It can be seen in flowering trees at forest edge, but it is scarce in degraded habitats adjacent to primary forest. It is rare in Central Plateau and absent from littoral forests and drier parts of rainforest. The Common Sunbird-Asity gives rapid, strident and high-pitched « sisisisisisisisisi » very characteristic and penetrating. This series is often followed by a second series of widely spaced similar notes. It also utters single “si” notes, and more drawn out “swee”. The Common Sunbird-Asity feeds on nectar from numerous flowering trees and pink, red and white flowers of various species. It also consumes small fruits and insects, the latter mainly during the nesting period when feeding the chicks. Insects are caught in aerial sallies or taken from dead leaf clumps and from bark crevices. Outside breeding season, it also joins mixed-species flocks. From some observations, the Common Sunbird-Asity prefers to insert the long tongue far into these flowers, rather than the long decurved bill. It forages high in the canopy and is often difficult to find. It is always very active, rarely stopping for more than a few seconds. The breeding behaviour of the Common Sunbird-Asity is poorly known and displays are not described. However, we can suggest that the bright head pattern is enhanced by adapted postures or head-turning, probably accompanied by song. The species is possibly polygynous, but the breeding system is flexible among the family. The Common Sunbird-Asity performs some seasonal movements related to nectar abundance. But some altitudinal movements may occur too. It is very active when feeding. During the flight, the long emarginated first primary feather produces a loud whirring noise. The nest is built between August and January, with peak of laying in October/December. The female builds a suspended, near-spherical structure with lateral entrance hole, about 5 metres above the ground. It is placed in understorey shrubs or low trees. It is made with green, drying moss and bamboo leaves, and some twigs and leaflets. From observations of some nests, the female lays two eggs and incubates. The male lacks the brood patch, but it has been recorded near the nest during this period. Both parents feed the young. The Common Sunbird-Asity is usually fairly common and widespread, but it is difficult to find. Although being restricted to the primary rainforest, the species occurs in several protected areas. The population is suspected to be stable. The Common Sunbird-Asity is not globally threatened and currently evaluated as Least Concern. The Common Sunbird-Asity is endemic to Madagascar. It is present in E of the island in mid-elevation and lower montane rainforest. This tiny, short-tailed bird has long, decurved bill and bright-coloured face pattern, especially during the breeding season. The sexual dimorphism is conspicuous during this period. It feeds on nectar from flowers, but it also takes small insects, especially when feeding the chicks. The nest is a suspended structure placed in shrub or low tree in the understorey. The Common Sunbird-Asity is fairly common and widespread throughout the range, and the species is not currently threatened. The Common Sunbird-Asity male in breeding plumage has dark blue metallic upperparts. The feathers of back and rump and the inner wing-coverts have iridescent blue fringes, whereas the primaries are fringed yellow. The underparts are mostly dull yellow with olive wash or streaking. The head is bright blue with a large, rectangular, sky-blue wattle around the eye. The colour is pale sky-blue above and behind the eye and dark violet-blue below the eye. The eyering is green. The long, strongly decurved bill is black with conspicuous ultramarine base on upper mandible, surrounded by pale green around the nostrils. The green colour extends to the base of the lower mandible. The eyes are dark brown. Legs and feet are black to olive-grey.